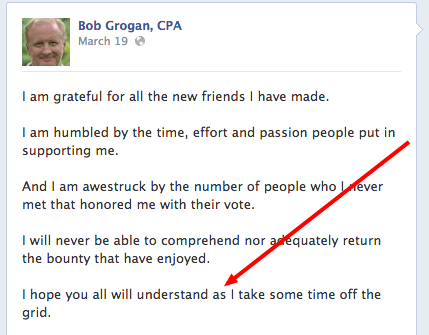 On his Facebook Wall, Bob Grogan promised that he was going to 'take some time off the grid', but we had no idea he would go all the way to Arizona! He sure is dedicated, we guess. Glad to know that after the tough primary race, Bob was able to pick up his keyboarding again. A benefit for the Shrine of St. Joseph in Yarnell takes place at 3 p.m. Sunday at the Christ Lutheran Church, 25 Chapel Rd. in Sedona. Vocalist Al Raitano and keyboard artist Bob Grogan will entertain the crowd with song and laughter. Play us off, Keyboard Cat!